The dropping of 11 stops in Laois, Limerick, Tipperary and Offaly on the Dublin to Limerick bus route will deliver a faster quicker service according to the Kilkenny company that operates the service. The company has also announced that it is recruiting full-time coach drivers in Naas, Carlow, Waterford, and Clonmel to drive on their main bus routes. In its official communication to the public on the changes to the 735 route, JJ Kavanagh & Sons promise to "operate a new faster timetable" on the Limerick – Dublin City – Dublin Airport service. 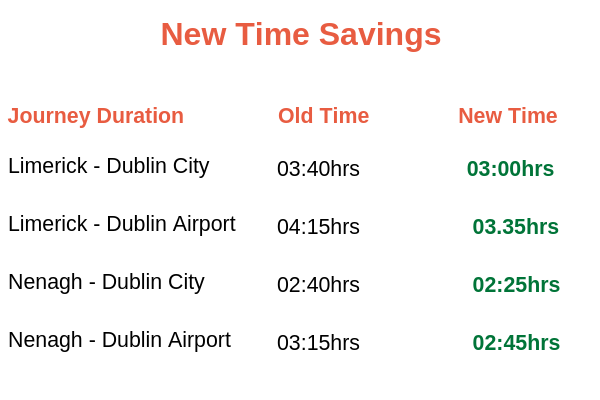 "Services from Limerick and Nenagh will now be quicker to Dublin City and Dublin Airport," it adds. The new service will have stops in Dublin, Limerick, Kildare, Portlaoise, Roscrea and Nenagh and will be motorway based. There are 25 official stops on the existing timetable. The amended will have just 14 stops with villages and towns losing stops. Two other stops will be dropped when students are not attending college in Limerick. It confirmed the village stops to be removed. "The following stops have been removed this service Belmont Cross, Dalys Cross, Annaholty, Birdhill, Toomevarra, Moneygall, Borris-In-Ossory, and Mountrath," it said. The timetable sets out other stops that will go. Passengers in Portlaoise will no longer have a Mountrath Road stop while Nenagh is losing the Springfort Retail Park Stop. There is also a rationalisation in Limerick city. The stop at the University of Limerick entrance (UL Flagpoles) is going as are the stops at the Parkway Shopping Centre and the Art College. The company's service to Lime Tree/Mary I and LIT on the Cratloe Road will operate during college term only. The number of Dublin stops goes up by one to four stops with a new one at North Wall Quay. The company does not refer to unofficial stops in villages also impacted by the change. The Urlingford-based company claims 40 minutes will be saved by people travelling from Limerick to Dublin city centre. Its website also confirmed that the new timetable will be operational from Tuesday, April 16. It does not say that it will operate an interim service for the villages pending the allocation of a new service through the National Transport Authority. The company told the Leinster Express, a sister website of Carlow Live, that the route was no longer viable.